Yesterday yesterday started. Movement in the bed, chronological. Fast morning and warm tea, getting colder in the carafe. A new project, a reality show. Each day, a performance of living. Each record, a matter. This is what it’s like to be here. In collage there was a younger girl with attention problems who made a photography art project called “This is what it’s like in here” showing how sad it was to be her, sad little negligee and fake blood and sorry eyes. I always hated that line, that direction, that girl. Pity the animal. This is what. Westerns with Joseph Cotton and Gary Cooper and the Preston Sturges actor who survived. No popcorn. Raw goji berry chocolate pieces. Cauliflower steak and tofu steak and wild rice and spinach salad. Lentil soup. Egg frittata with red peppers. Flavor tray. Gertrude Stein and Maria Damon. Bob Kauffman. Fanny Howe at the end of it all, her wild childhood now in pieces. The Rumpus: How did the idea for this project come about? Ben Doller: We were in a rough patch, as the book makes clear. I had been diagnosed with cancer (stage III melanoma), and our world suddenly looked very different. It was difficult to see the significance of writing amidst the shock and despair, and I think Sandra decided at some point that perhaps a collaborative, ritualized project could benefit us both in different ways. We had significantly and rapidly changed our lifestyle, and there was a desire to buy into homeopathic remedies and cures. I’ve never been a meditative sort—most of my writing is anxiety driven. I think that Sandra thought this project could be a sort of Trojan Horse to trick me into a more meditative approach to creative practice and, in turn, life. Sandra Doller: The answer above is interesting to me. The way this project is. I like to hear the secret thoughts of my constant companion. Even if we think we’re communicating everything, we’re not. There’s always some surprise in the revelation, the articulation. I don’t remember it that way. Not exactly. I suppose factually—I did decide we had to do this. It’s a way of being alive. Rumpus: There must be something fascinating about reading the secrets of the person you know best, even if those secrets are perceptions of your shared days together. Ben, your last name used to be Doyle, and Sandra, yours was Miller, right? How did you get the idea to meld your last names? Why was this important for you? Sandra: We’d been together/married (same thing) for two years and when we moved to California we made a new name. We like to practice androgynous shared identity. This is ongoing. Although when Ben got sick, I had to realize we don’t share a body. And now, pregnant as I am, that is apparent in every way. We share a body and we don’t. We share a name yet people still assume I took his. My father addresses my mail to Mrs. John Benjamin Doller, which makes me lethal. 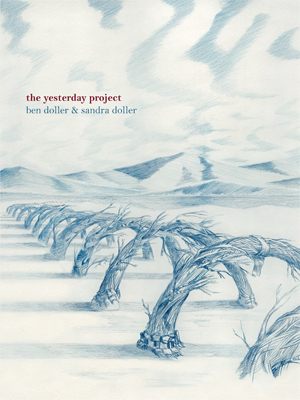 The Yesterday Project is actually their second collaboration, after The Sonneteers (Editions Eclipse, 2014), and where that earlier work (composed a decade or so prior to this current work) was a far more direct collaboration, this new project was composed as two distinct threads composed side-by-side, without either reading what the other had written. What makes the combination of the two threads curious is in seeing the parallels that float through such, as they both respond to their shared previous days, one after another, including their unspoken moments, shared outings and day to day tasks, and shared and individual responses and anxieties around Ben’s threatened health. Given there are two in a shared space writing concurrently, the project becomes an intriguing memory project, articulating the different perspectives, what either recall, and how, and what either might choose to highlight from the immediate day prior. The book also includes a series of wonderfully mundane details, from cooking, reading and simply being, some of which reveal the most astounding insight, and at other times, become almost self-conscious (“There are so many things I forgot to put in the yesterdays that would probably make better news.”). Given their looming health crisis, there is an obvious anxiety that threads itself through their collaboration (the largest, admittedly, of a number of anxieties that run through the book, including: “I am trying to be better. I am trying to see people.”), one that most likely opens up the possibility for a deeper level of intimacy in composing the two sides of their conversation (and, despite the fact that pieces weren’t read by the other, these are pieces directed at each other, which make them very much a conversation; simply because the texts weren’t read doesn’t mean they weren’t communicating). This book might not have been originally intended for publication, but make for an incredibly deep and rich conversation between their private and public selves, both individually and together.